In a society that values independence, self-preservation and individualistic thinking, we are missing the key to fulfillment: Connection through Attachment. Simply, attachment is the way that we connect to each other. Without attachment, people feel alone to deal with challenges they face, which leads to distress, dysfunction and mental health disorders. It is possible to repair dysfunctional attachment, but first it is necessary to recognize attachment style, unhealthy relationship patterns, and the impact they are having. Improve your client’s relationships by teaching them strategies to feel more connected, reestablish trust, and restore positive emotions. 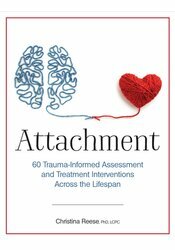 Dr. Christina Reese, a recognized attachment and trauma professional, has created a comprehensive guide that explains attachment over a lifetime, and offers trauma-informed approaches to treat attachment at any age. Christina Reese, LCPC, PhD, is a licensed clinical professional counselor in Maryland and Pennsylvania and a licensed clinical supervisor in Maryland. Dr. Reese has almost 20 years of experience working with children and families in areas of attachment, trauma, depression, anxiety, bipolar, ADHD, and ODD. Her passion is working on attachment with adoptive families, coming alongside them to build strong families based in trust and healthy attachment.